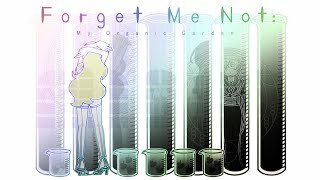 Forget Me Not: My Organic Garden on the Playism Store | Bringing a different breed of indie game to the world. "I can hear you, no need to shout! Oh, my! This is a rather firm Kidney." My Organic Garden is an indie avant-garde organ-clicking game. Organa, the main character, is working as an apprentice at her master Irene’s shop. Irene’s shop is one that raises mysterious plants that grow organs, which are then harvested and sold to the villagers. In the game, you’ll quickly click the plants and tools on screen and deliver plenty of organs. Everything from the UI to the artwork works to build this peculiar world. Before you realize it, you can’t help but to keep clicking away. The gameplay, the story, and the comfort you get from sinking into a world different from our own – it’s everything a dojin game should be. My Organic Garden was an idea that has been floating around for a few years. Please enjoy a world where a few slightly odd organisms can exist normally. What do you think about Forget Me Not: My Organic Garden? “On a sleepless night, enjoy a moving story.” CAVYHOUSE is a game production group formed in 2010. From that group, Yoshino handled the directing, graphics, and programming, while y0s wrote the scenario.